It doesn't get much better ... the perfect ocean wedding in Baja! 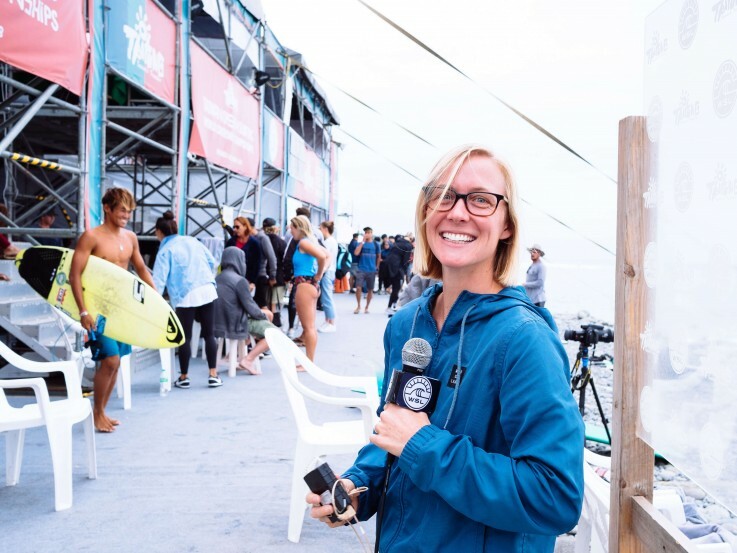 Shannon brings a natural, positive and animated energy to every surf event she commentates, either gracing our pixilated screens in the webcast booth or out on the front lines with the athletes in post heat interviews. She takes to the mic as a lover of surfing, a longboarding enthusiast and an advocate of women in the sport, and takes pride in sharing competitors stories, triumphs and sometimes the inevitable disappointments. 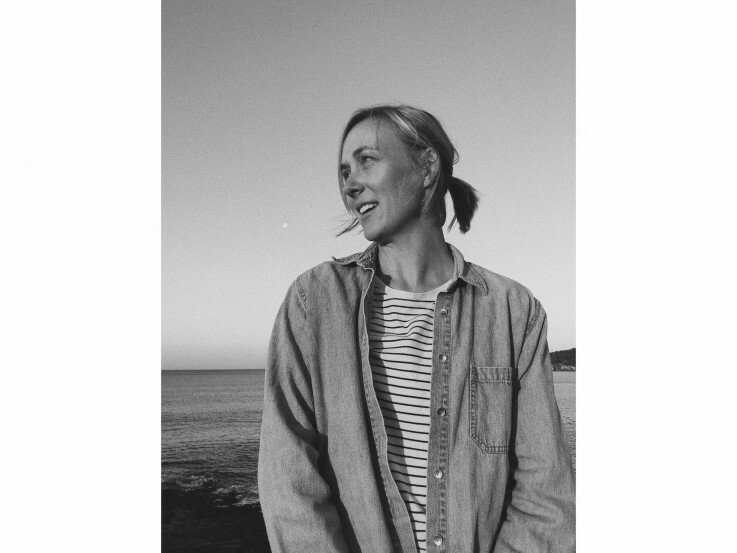 Shannon may have happened upon commentating unintentionally via her work with Christian Surfers in South Africa [CSALT], but it is no accident that she is in demand, taking sought after gigs with the World Surf League and International Surfing Association across the globe. Her genuine nature, knowledge of the sport, and passion for its players, make her an easy choice to eloquently capture the action, and a welcome voice in a largely male-dominated profession in the industry. 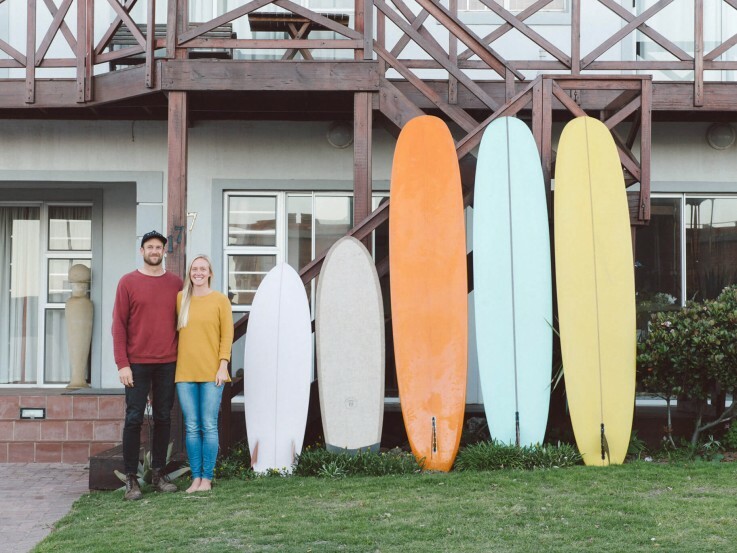 Originally from California’s famous Huntington Beach, Shannon and her husband Aaron, both passionate surfers, call the cold water paradise of Jeffreys Bay home, in between the sometimes strenuous time on the road for work. But there are no complaints here. As a previously competitive longboarder herself, Shannon shows only gratitude for her line of work, and optimism for the development and coverage of women’s surfing in the future. So, where do you call home now, and how did you end up there? Home now is Jeffrey’s Bay, South Africa. I have lived there for just over six years. And my husband has now been there with me for about two years. I moved there originally to do an internship with Christian Surfers, called CSALT, and it was a really good experience. I thought I would take about 5 months away from home, do this cool internship, learn a little bit about the surf industry and how to bring service into that space. We do a lot of behind the scenes work at events and just make sure that little jobs are covered in the background to take stress away from people. And I ended up just never leaving. So 6 years later I still am involved with Christian Surfers, my husband works for them full time for their international office which is based in Jeffrey’s Bay, and we just really love it. We kind of want to stay forever because we have this perfect right hand point break as our front yard and a really great small community and it’s just a really special place. Tell us about your work. What does a typical day on the job look like? So I work as a commentator for the World Surf League and the ISA, International Surfing Association, on a variety of random events. My main gig, that I love the most, is working for the WSL Longboard Championship Tour. But I work a bunch of QS events for the WSL and I’ve just recently started doing some of the World Championship stuff for the ISA. A typical day on the job is … wake up long before the sun rises and be at the beach as early as possible and see what the call is. If the surf is good then the events is on and work generally will start straight away. Obviously if it’s a lay day, it means we have a day off which means maybe we can surf. A day on the job, pretty much depends on the schedule, but usually start with a few heats on webcast, as I am a webcast commentator. I also do post heat interviews, and very occasionally will jump on the beach announcer’s microphone if they need that space filled. 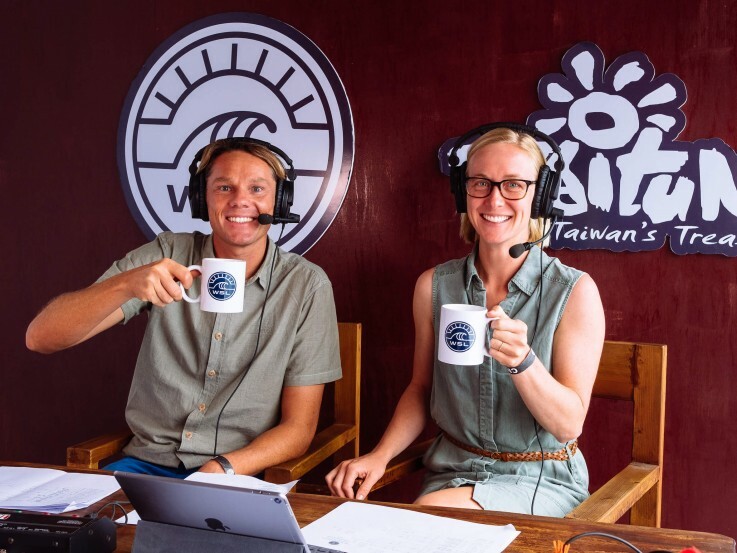 I usually just hang out with the commentary team, getting a feel for what the vibe is in the water and trying to give the best take on what’s happening on the beach and in the water, to our viewers back home. 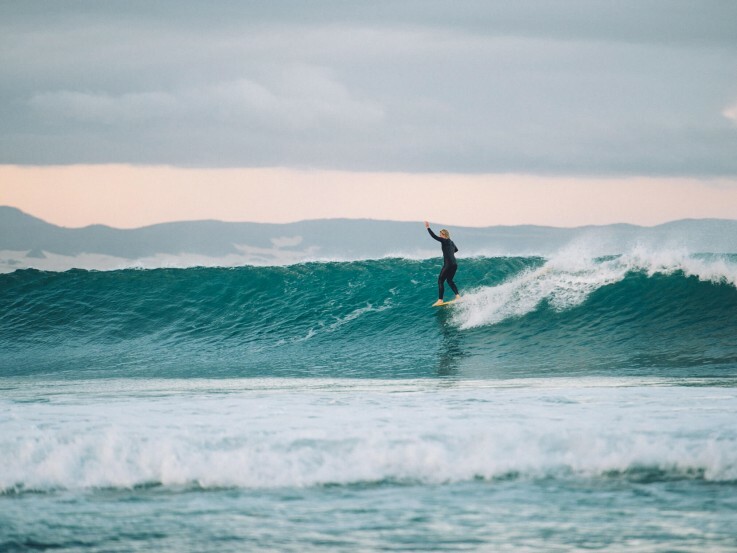 Tell us about the journey that brought you to commentating for the WSL? I started doing Beach Announcing in South Africa. I think because I had an American accent they really liked that sound on the beach, very different from the South Africans that I hang out with, that normally beach announce. I just got thrown in the mix through Christian Surfers, doing some back ground work at contests and helping out that way. At one stage I was doing kind of ok in my competitive longboarding career within South Africa, which doesn’t say very much, but there is a little bit of a scene there. And my shaper told me to go surf a contest in Taiwan, which was a Longboarding Qualifying Event, a QS. So I put all my money into it, flew to Asia, surfed the contest, lost the first round, first heat. I think my heat total was about 3.0 which is pretty standard for me competing for any WSL events. As I was walking out of the water I bumped into Will Hayden-Smith and Steve Robertson, who are both the WSL Regional Managers for this area, for Australia, Oceania, Asia, and overheard them saying that the beach announcer was a no show that day. They were just discussing among themselves and I happened to overhear the conversation, so I just offered to help out because I’d been knocked out the contest and I was suddenly in Taiwan for a couple weeks with nothing to do. They were like, cool, you can help us out, and that’s what I’m used to doing with CS, heaps of volunteer work. So I beach announced for that event, and went to the world championships for longboarding in China the following week, and beach announced for them there too, as I wasn’t in that event. Definitely not good enough to qualify for that one! And suddenly that turned into a job and Will and Robbo were amazing. They offered me a position with them and wanted to train me on the webcast side, which I was never interested in. I hated hearing my own voice on anything, absolutely hated it. Somehow it just works and from what I hear I am decent at the job, and I just keep getting hired for more events. I worked with John Shimooka from Surfing NSW and he set me up with a few events and I’ve been lucky to work alongside some really amazing teams. So that’s how the journey started and how I got to where I am, just being in the right place at the right time. I love being able to give the girls and guys that are in the water this opportunity to be known for who they are. That’s what’s really fun about the job. What’s your favourite event to work at? Oh easily the Longboard World Championships. That ran for its second year in a row in Taiwan at the end of last year, and in China for a few years before that. But the Championship Event for the Longboard World Tour is my favourite. I’ve got so many friends that are on tour, and so many girls that I travel with during the year, and it’s just a really special environment. The longboard world tour crew is just a family, and when we do get back together it’s really fun. There’s only one event each year, hopefully that changes and the tour grows, so it’s our only chance to see each other too. If you could commentate at ANY surf event in the World, which would it be? Oh gosh. Probably the J-Bay Open, now that it’s a Womens event, and that’s been my home for so long. I had a little bit of beach announcing there this year which was really cool. It was really special to be given that opportunity to have a girls voice. I think that would definitely be the dream though, it would be pretty special to be on the webcast for the girls for that event. What did you do before you started working for WSL? So I was working for the Cristian Surfers as a full time volunteer within South Africa. I was at that stage the national women’s coordinator for CS South Africa. Which meant growing our relationship with different girls within the surfing community, throughout the whole country. Just pouring in to them and giving them a better loving environment within the surf community. It’s so difficult for girls, but I think things are changing in a really positive way. There’s so much good stuff that’s happening for women’s surfing. From a Christian side, we love Jesus and we’re not ashamed of that in any way. He is in so much in our lives and we want to share that with other people, but we also want to bring a very practical aspect of that. We want to create a positive, safe environment, a fun environment. Fun is one of our core values, essentially bringing that to all levels of surfing from groms to professionals and everything in between. I’ve just completed a Level 2 Sports Chaplaincy training, which is basically being that person of safety and peace within a contest environment, that’s neutral … not a coach, not organising role. We’re not expecting anything from a surfer, we just want to be there for them. Obviously if there’s a major issue that goes down, something tragic, then we are there on site for that kind of space. At the end of the day we are just there to be a friend, and that’s really special. That’s part of the role that I fill on the Longboard World Tour as well with the WSL. It has opened up some great opportunities with the girls and just really good friendships. What advise would you give to anyone looking to get into commentating? I would say just start by volunteering at local boardriders. Get involved on the mic and beach announcing stuff. That’s how I started out and it worked out really well for me. Obviously a lot of it goes hand-in-hand with having a good work ethic and being someone that your boss or employer values as part of the team. From there it just carries through and that would probably be the case with any job. Follow stats, read up on things. I’m probably the worst at that because I don’t actually enjoy watching contests, shame on me, but this is my job. My husband sometimes makes me sit down and watch a major event. “Go learn, listen to what Joe’s doing, listen to what Rosie’s doing”, which has been really helpful. Watch, learn, listen, and start bringing that into your beach announcing. Try to act professionally within it. I think a lot of people approach beach announcing with a really relaxed style, which is cool, keeping it fun. But if you want to become a proper commentator and work on the webcast, then the professional side of it is actually really important. How you carry yourself and the relationships you build within that space. How and when did your passion for surfing start? My dad’s a surfer, and I grew up in Huntington beach. I was in the water from a really young age. I didn’t really start surfing until I was around early high school. I’d caught my first waves when I was just tiny but that was pretty much it. My dad used to pick me up from school in his beaten up VW bus and we would drive down the road, because my high school was really close to the beach. I would surf on my lunch breaks and then be back in time for soccer practice. And that’s pretty much where it all started. I never dreamed of competing or doing anything within the industry. I just surfed with my dad. It’s definitely one of the most important things in my life, and it’s definitely shaped who I’ve become as a person. Even from the places I travel to … they have to have a coastline, there’s not really an option to go anywhere else. And it’s definitely shaped the way I think about living a healthier lifestyle, staying active and being in the ocean. It’s also something that my dad instilled within my brother and I from a young age, to have surfing as something we can do until we are in our seventies or eighties. It doesn’t mean it stops with a competitive career. It doesn’t mean that it stops when you have kids, or family, or any of those things. But it’s something I could do with my kids one day, maybe even my grandkids at that stage. I know a couple of ladies in South Africa, that I surf with, that are in their seventies and they still shred. They can still nose ride, it’s crazy. So yeah, it’s just the fact that it can be part of our life for so long that is really special and really unique within the sporting scene. Jeffreys Bay, Lower Point, is the best longboarding wave in the world and it’s my front yard, and there is just no comparison. Aside from maybe Noosa on a really good day, when there is no one out, which doesn’t happen ever. And the only reason that’s really better, is because it’s warmer. So yeah, JBay! Honestly my last surf there last year was probably the best Lower Point that I’ve had, maybe in my life. It was double overhead, and this east swell which is a little bit weird. And I was riding my 9’4 heavy log single fin, that I want to travel with but it’s too heavy, so I leave it at home. I was getting nose rides on waves that were double over head. It was just perfect. No one in the lineup could really surf, which was really great ‘coz there are so many good surfers in town and it was just a random swell that hit one afternoon and it was just right moment, right time, and I left town the next day. My husband Aaron Hughes. He’s so good. He rides finless boards, and he rides fishes, and in his terms he’s “learning” how to longboard, but he could already nose ride within a year of riding a log. He’s really good at surfing, and he can get barreled on a finless board when it’s 10ft Supers, which is huge and hectic and crazy. I don’t know how you do that, it terrifies me. He’s like the next Derek Hynd when it comes to finless surfing, and he’s really humble and sweet and all of those things too. He’s going to hate this [laughs]. Oh Papua New Guinea hands down. We had a longboard World Championship Tour event there two years ago, and every island type of disease that you could get was on the cards. The surf was phenomenal but it was just the craziest misson to be there. A really small camp set up on this reef out in the middle of nowhere. Probably only 50kms away from the main town, but it took 3.5 hours to drive there because the roads are so bad that you have to drive at 5 miles an hour. It was pretty hectic, but it was one of the coolest experiences of my life. The surf was amazing and the locals could surf so well. It was a wild experience. This log that I have at home, it’s just so good, 9’4. Des Sawyer is my shaper, his son Stevie is on the Longboard World Tour. I’ve had a few really good ones from over the years, but that’s probably the best one. Also this other board that I have is a double ender log, also single fin, really heavy, but literally the nose and the tail look exactly the same. It’s kind of a funny one, really flat but it’s magic in certain conditions. My husband and I got married in the ocean and that’s the board I was on when I got married, so that was really cool. It’s like the dream board. Probably my blond hair, it’s basically white. And longboarding. Probably my husband, he’s just really really wonderful in every way. He helps me to be a better person, to love people better and to focus on the things that are truly important. I just still can’t believe he married me. I don’t know … he’s it. He’s the greatest. Ooh this is hard because I feel like some of these people are already friends of mine, that I don’t get to spend that much time with. Rachel Tilly for who inspires me. Just to spend a day surfing with her and getting some coaching from her, maybe and riding different boards. Lucy Small, without a doubt, she’s also a friend of mine. She’s from WA and I just don’t know what country I would end up in that day because she just makes these decisions on the fly and decides to go fight for world peace, or help the refugees somewhere. Right now she’s living in Mozambique and teaching kids how to surf. She basically single-handedly started the life guarding program at Tofo in Mozambique, where there are so many deaths because people just don’t know how to swim. There hasn’t been a lifeguarding program, so she just moved over and decided to start one. It’s totally crazy.